This is a recipe perfect for the summer when you have a lot of fresh vegetables available. the colors and textures you have with this recipe will be a life saver during the very hot afternoons. Pretty good for you too! Wash the romaine lettuce and separate the leaves one by one. In a pan, saute the chicken in the oil for 1 minute. Add in the onions, garlic and peppers and saute until fragrant. Add in the vinegar, fish sauce and sugar. Stir fry until the chicken is fully cooked, about 2 minutes. 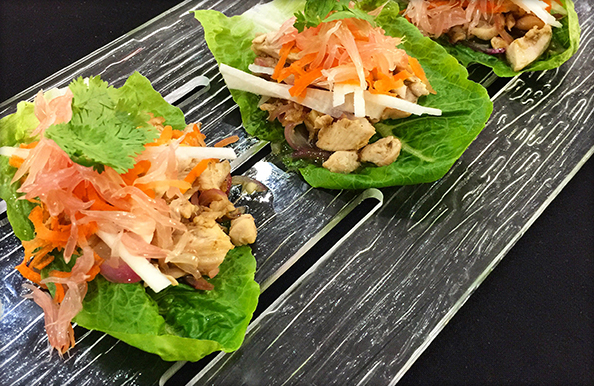 Fill each lettuce leaf with the chicken, some carrots, jicama and pomelo. Top with cilantro and serve immediately. 1 comment on "Fish Sauce Chicken in Lettuce Pouch"
Thanks Chef for this recipe!